For drivers in the Mid-Michigan area, the 2017 Honda CR-V offers a long list of technology features inside one of the most well-equipped and versatile cabins on the road. With features that provide extra comfort and convenience, entertainment and safety, the CR-V is there for you every step of the way, no matter what your destination. Even on the entry-level LX model, drivers will still get an extensive list of comfort technology features that you would be hard-pressed to find on comparable models. As Consumer Reports says, “Honda is moving the interior upscale, adding premium trim bits for the high-end trim.” The interior is comfortable, with features that include an automatic climate control system, power door and tailgate locks, cruise control, and much more. The entry-level LX model also has standard entertainment features to keep everyone entertained no matter how long the journey—whether it’s across the state or just a jaunt around the corner. Connect your devices via Bluetooth HandsFreeLink and streaming audio, and enjoy discovering new artists with Pandora compatibility. There is also speed-sensitive volume control that will automatically lower the volume when the cruising CR-V slows down to reduce distractions when the driver’s concentration needs to be high, such as in a merging situation. For drivers who want even more comfort and convenient technology, there are a number of upgrades and additional features to discover as you explore the upper trim levels. Dual-Zone Automatic Climate Control System – Starting with the EX model is an upgrade to a dual-zone automatic climate control system, so everyone inside the CR-V, no matter where they are sitting, can enjoy their ideal temperature. Push-Button Start – Starting with the EX model, drivers can start the engine of the CR-V with a simple touch of a button. 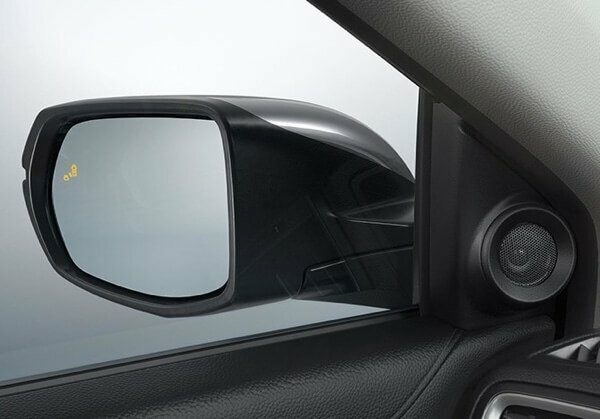 Automatic Dimming Rearview Mirror – The EX trim also sees an upgrade to an automatic dimming rearview mirror that minimizes headlight glare from the car behind. HomeLink Remote System – Starting with the EX-L model is the HomeLink remote system, which lets drivers control garage doors, home security systems, even your home’s thermostat. For drivers who want more entertainment features than the standard offerings, the upper trim levels offer upgrades to some of the equipment in the LX and add a few brand-new features. Additional USB Charging Port in the Second Row – The upper trim levels see an additional USB port in the second row, so whether you’re sitting in the front or the rear, you can charge up your devices with ease. 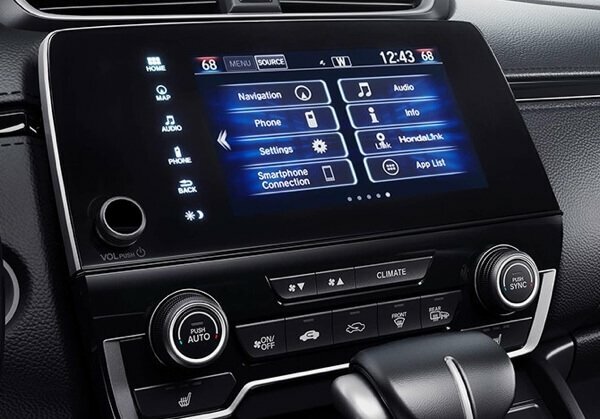 7-Inch Display Audio – Upgraded from a 5-inch color touchscreen on the entry-level LX, the 7-inch Display Audio touchscreen comes with a customizable feature setting so you can put the controls that you use the most often right at your fingertips. Apple CarPlay and Android Auto – Sync up your smartphone, whether it’s an iPhone or an Android, and access your favorite content and apps seamlessly. SMS Text Message Function – Access text messages on your phone to read, create, or reply safely without taking your eyes off the road. Navigation System – A satellite-linked navigation system with voice recognition is available on the EX-L model and standard on the Touring model to help you arrive at your destination on time, every time. Starting with the EX model, the CR-V also comes equipped with the Honda Sensing suite of driver-assist technology to help drivers drive better and safer on the road. Collision Mitigation Braking System – This system can detect when the CR-V is dangerously approaching an oncoming vehicle or other object and can employ the brakes in order to avoid any impact. Road Departure Mitigation System – If the CR-V drives over lane lines or road markings, this system can automatically utilize the brakes and steering in order to keep the CR-V from going off the road. Lane Keeping Assist System – If the CR-V starts to sway or go over lane lines on the highway, this system can nudge the steering to bring the CR-V back to the center of the lane. Adaptive Cruise Control with Low-Speed Follow – Drivers can select the speed and distance interval with the vehicle ahead, and this system balances between the two to keep the CR-V naturally within the flow of traffic without any input from the driver. Blind Spot Monitoring System with Cross Traffic Monitor – This system monitors the activity in the driver’s blind spot and alerts the driver if a lane change is signaled and the coast is not clear. Visit your nearest Mid-Michigan Honda Dealer to find out more information on all the tech features inside the 2017 Honda CR-V. Explore current offers and financing options, and get behind the wheel for a test drive of the CR-V to explore its tech features and everything else it has to offer.